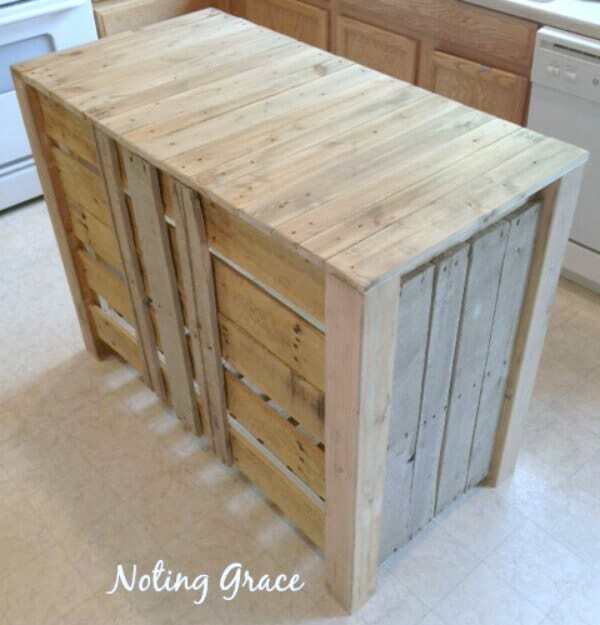 DIY Pallet Kitchen Island for less than $50! When we were living in a rental for a year, our home was lacking on counter space and it didn’t have a kitchen island. 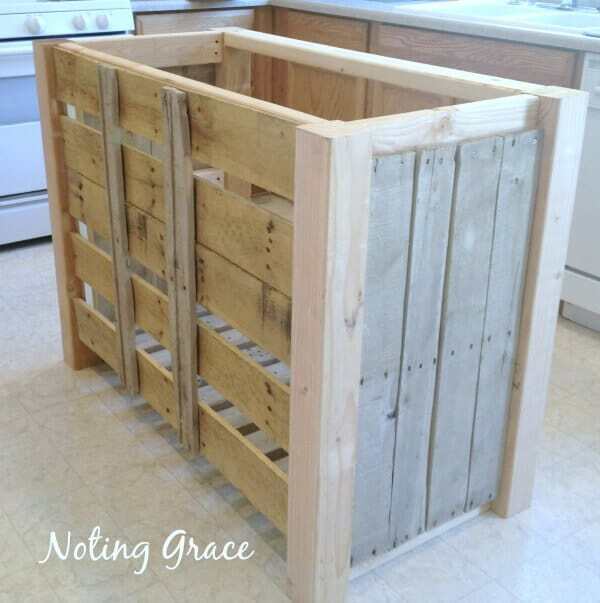 I adore pallets and when we needed a budget friendly option, I turned to what I knew would be most economical! 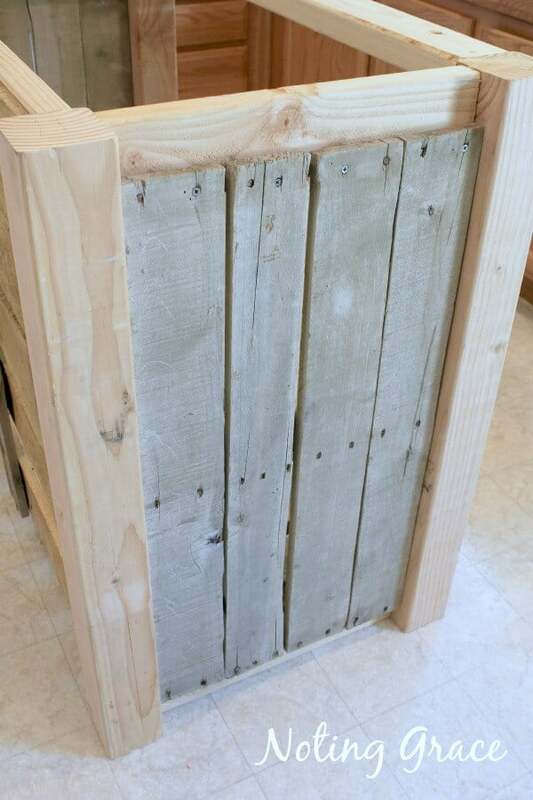 Loving how our Pallet Bookcase turned out, I wanted to do something similar. 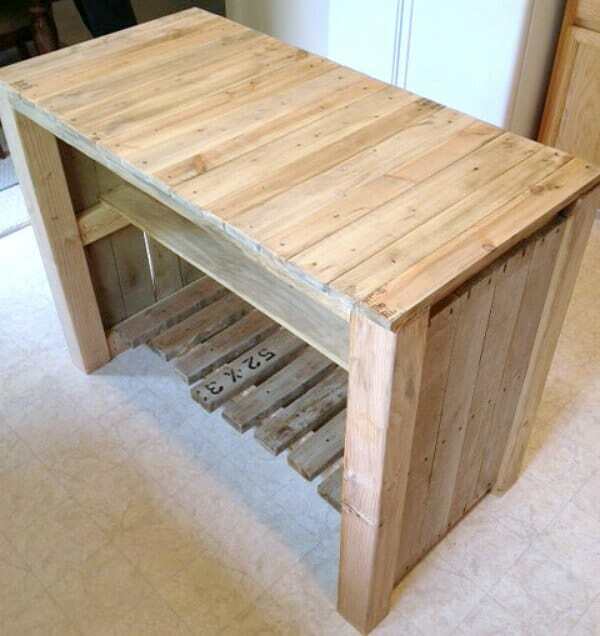 Here’s how you can build a DIY Pallet Kitchen Island yourself for less than $50. 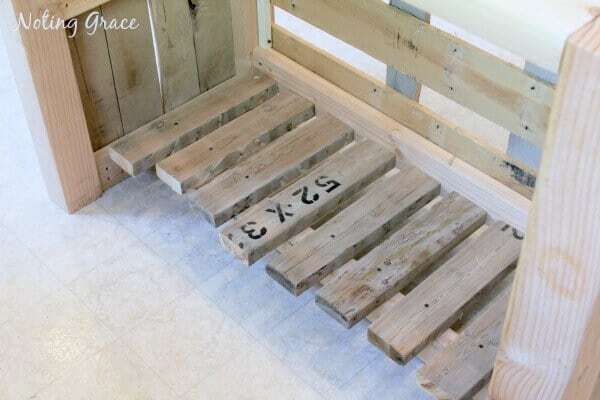 2 – 2 X 4s – the length of board should fit your space. We used scrap wood. We didn’t have an existing frame as we did with our Pallet Bookcase, so we had to build a frame. This wood purchase was all that was needed for this project, but you can buy all the wood for the framing inexpensively. The corner posts are 4 x 4s cut to our counter height. The framing is from 2 x 4s. Make sure there is enough clearance for any appliance doors before you make your cuts. We measured for the exact fit of this kitchen as well as our height, so I am not including exact measurements since your space will vary. They should fit to your space and needs. I wanted the weathered pieces to be the most prominent, so we cut and fit them to the sides and attached by using the existing holes. Look at that beautiful, natural gray, washed out by wind, sun and rain! 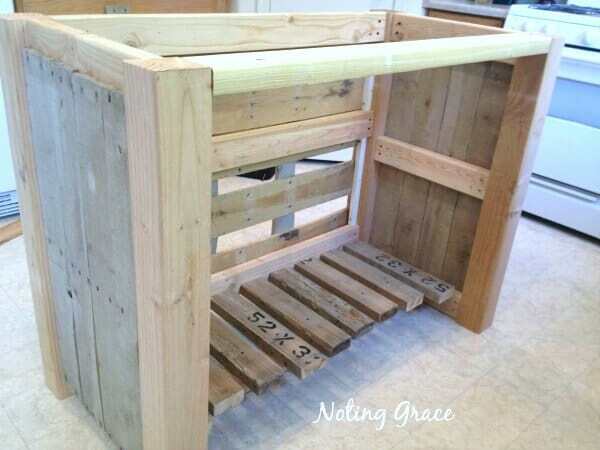 We built this DIY Pallet Kitchen Island’s to create additional storage space, but hidden from plain view. We created shelves and a front to hide the storage. For the front, I wanted a rustic, pieced together feel, so I varied my wood textures and hues. The very bottom shelf was most visible. 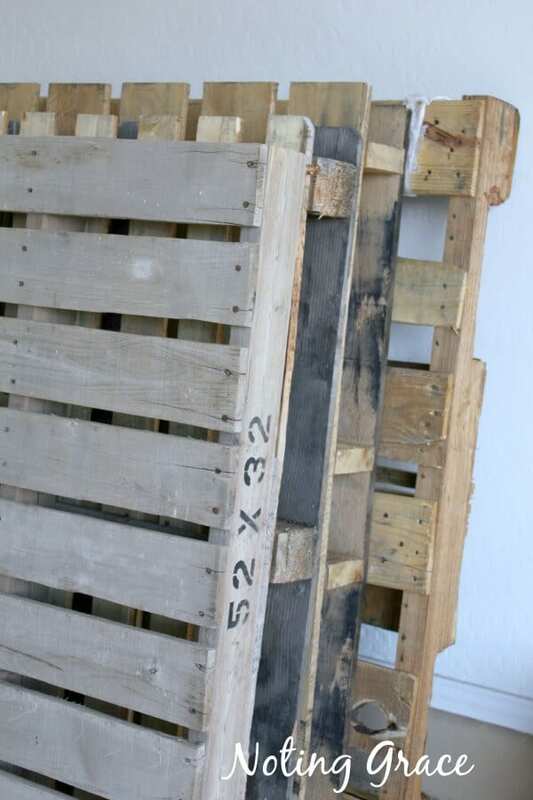 Continuing with that weathered, rustic feel, we cut pallet sides to varying lengths and used distressing glaze to hide the cuts. Now for the next shelf and top! Using the braces on the sides, we cut scrap wood to fit the length between the two braces. For the top, we used other wood from a previous project in order to cut our wood costs. Recycling and upcycling is key to saving money! 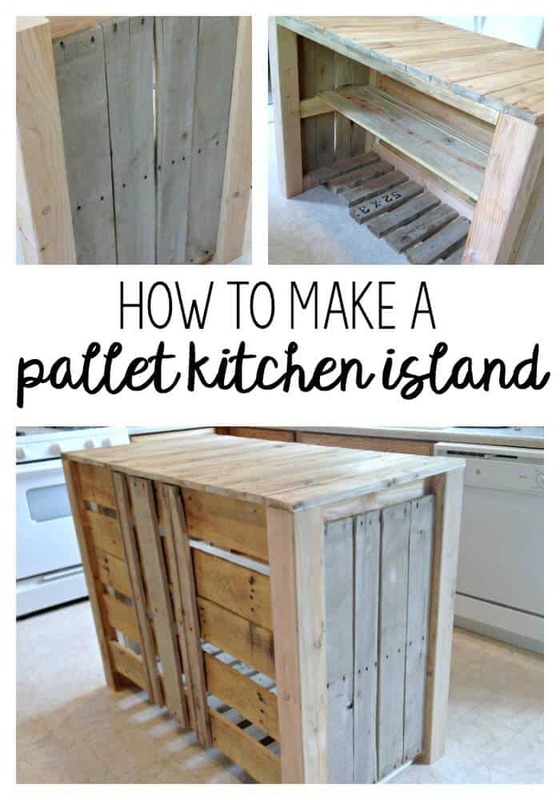 It’s important to note: I don’t recommend using pallet wood for the top of a kitchen island. 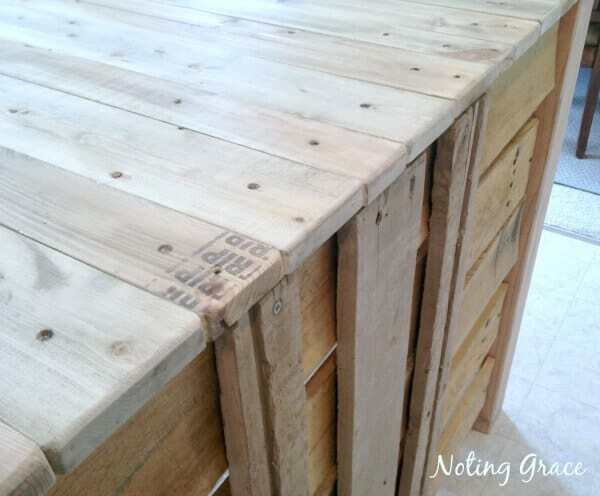 Since pallet wood is treated with chemicals, it isn’t safe for a food prepping surface. 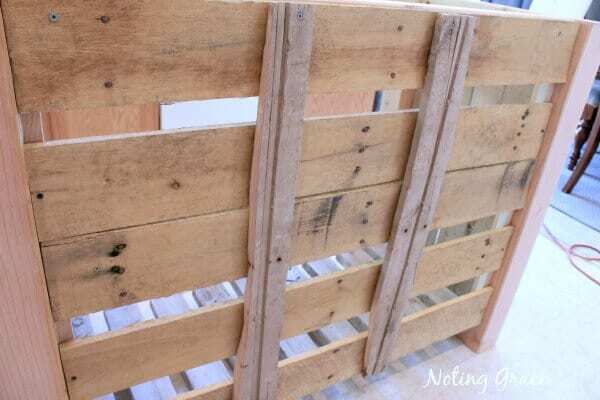 If you don’t have scrap wood on hand, this will add to your bottom line if you need to purchase it. Since the wood was new, I distressing the top and frame to create a weathered look. This also added a semi-seal to help with food stains. 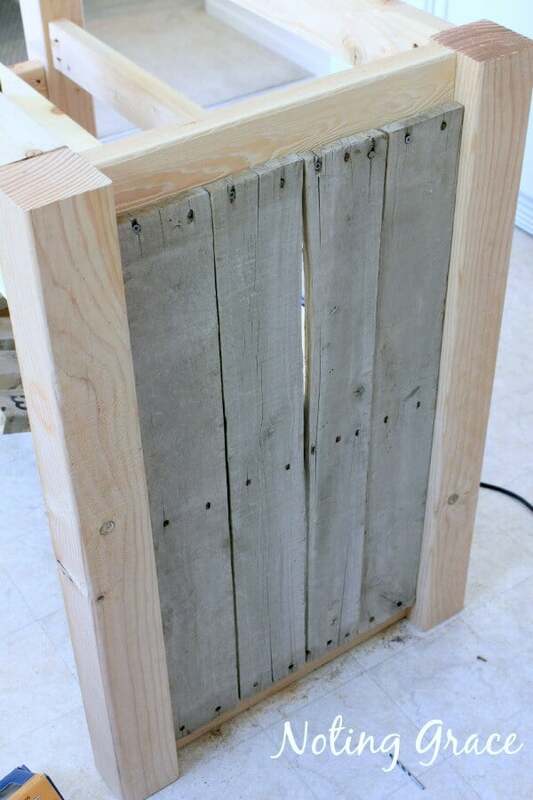 An easy weekend project that didn’t take rocket science to create. All for less than $50. It was a helpful addition to storage and was cute to boot! 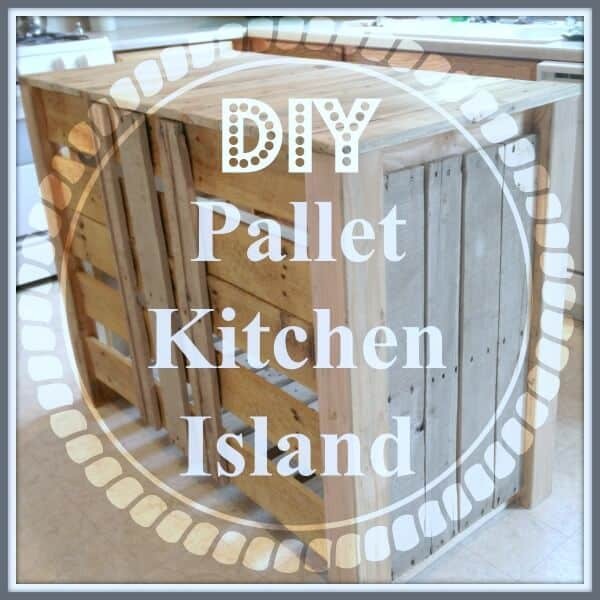 If this post inspires you to build your own DIY Pallet Kitchen Island, be sure to share your creations with me! I’d love to see what you come up with. For more tips on how to decorate a rental, you can read how we adding our touch here. 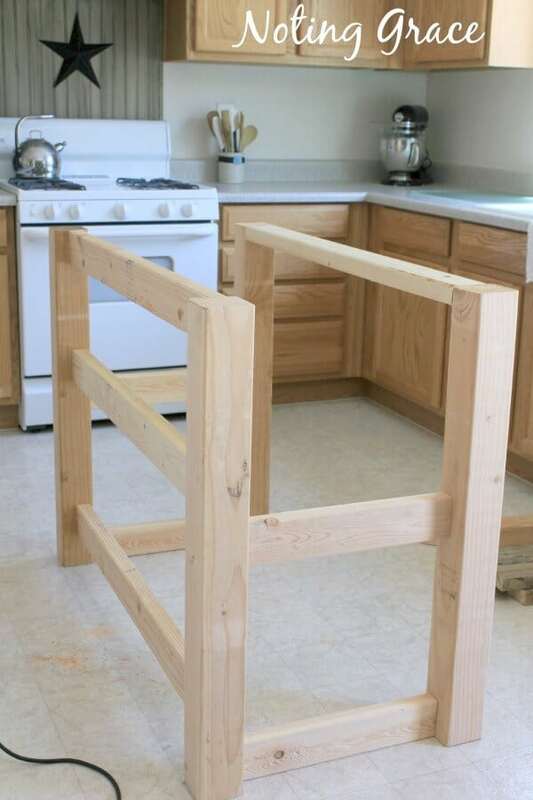 UPDATE: You should see this kitchen island now! We converted it to fit our Farmhouse kitchen. I share with these wonderful people. Find out where I’ve been Featured! So cute! What a great idea. 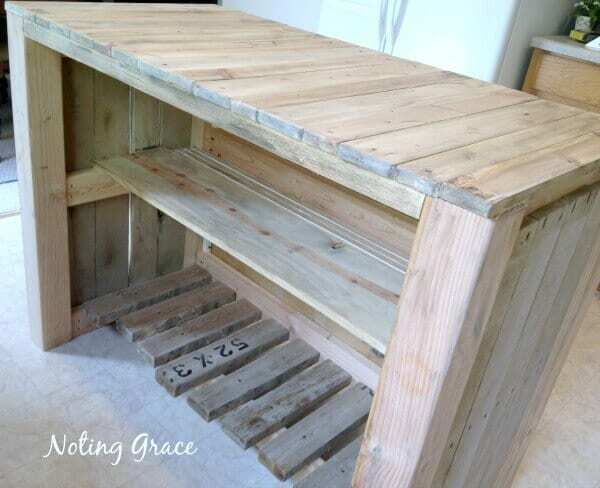 If you aren't using it for an island anymore it would be a cute potting bench. We just built an island for our daughter's deck – It was a lot of work but turned out so well! Yours is cute. Nice job! This is a very nice tutorial on making an island and it came out so good. 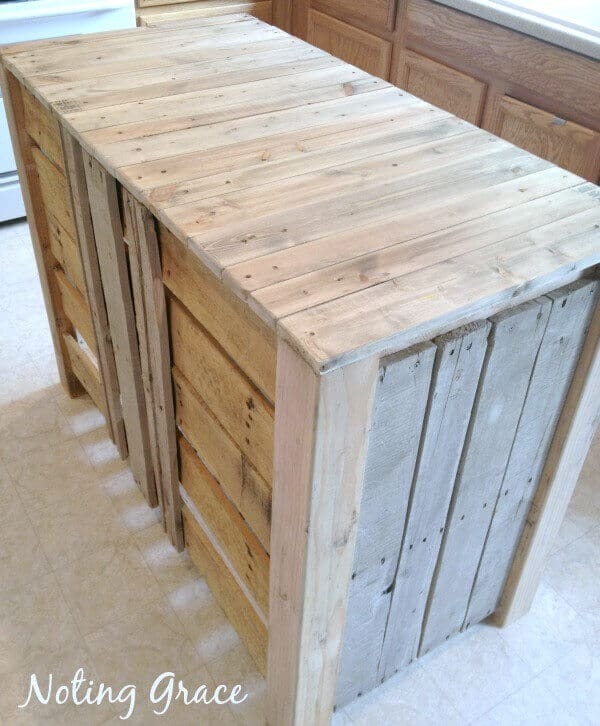 LOVE your $50 kitchen island…it will be featured at my arty on Monday. Thank you for sharing it at Show and Share. Omg Linda this is so adorable that I pinned it for later use. 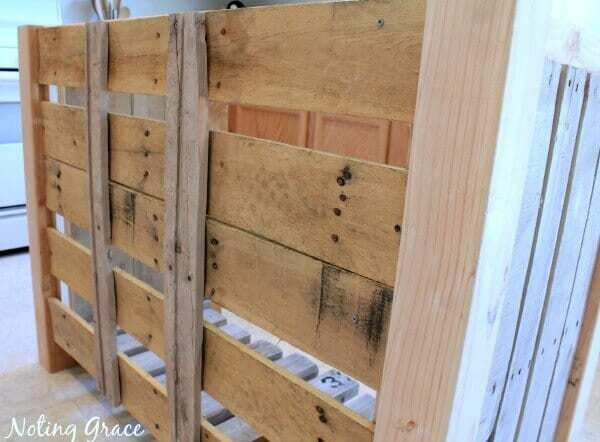 Gorgeous, love this have 20 pallets in the basement just waiting for this!!! How did you attach the cross pieces to the 4 X 4’s. We toenailed them in, meaning we drilled thru the cross piece in at an angle toward the 4 x 4 to connect the two boards together. If I had a kreg-jig, I would have used that, but the toenailing does the trick. Hope that helps – feel free to ask me any other questions you may have!